I'm still alive. Sorry, I forgot last week to tell you that we had Zone Conference on Wednesday so P-day is today... Thursday. I hope no one was too worried. Zone conference was great. Always a good boost. One really fun thing here is that we play volleyball every week as a district with some of the members from around here. Hopefully more people will come when it gets warmer. This past week we were playing and there were definitely snow flurries blowing around. It really wasn't THAT cold, but it was windy and there are mountains around. As far as the work goes.... We've mostly been doing a lot of finding and trying to work with members. We did meet a less active member the other day. She works in a Panificio (a bread store). We had been told that she want's to come back to church and so we went by to talk with her and support her, etc. We were standing there talking to her and she is AMAZING. While we were there, she gave away a book of mormon, comitted this guy to pray and read, testified of how the book of Mormon would change his life if he prayed sincerely, and invited him to church. She also told us to call her and she would come with us to do some missionary work. It was amazing! She is great. We also had a referral from the elders. There was a family that the husband was never home when they tried to stop by and so they couldn't go in the home. We stopped by and were able to give them a book of mormon and we invited them to watch general conference and read some talks. They are a beautiful and wonderful family. They have two little girls and are so nice. It was wonderful to get to testify to them of the reality and blessing it is to have a living prophet today to guide and direct us. I'm looking forward to hearing conference soon! I'm trying to remember if there's anythings else that I should tell ya, but I'm coming up blank, so maybe I'll go ahead and attach some pictures. It really is a beautiful area. I like that we get to go a little outside the city on a regular basis. It seems like the people are more concentrated in a little area here. In Rome there are just a lot of people everywhere. Alirighty. Love you all. It's always wonderful to hear from everyone and I hope everyone is doing great! Love ya bunches and bunches! Me and my new collega, Sorella Favero. This is looking towards Florence from a little bit outside the city. Its BEAUTIFUL! Okay... so this is me with a poster of Giusy Ferreri. We do service at a Casa di Cura (nursing home) here too, and one of the old men there told me I looked exactly like this girl. It was quite humerous. He had cataracts. That's the only explanation I can come up with why he would think I looked like her. Pretty funny. Last week we played Risiko! (Risk!) as a district for p-day, and the elders all dressed up in soccer jerseys. It was pretty fun. From left to right. Sorella Favero, Anziani Mondragon, Kunzler, Mack, and Helm. They are a lot of fun. I didn't win.. but it was my first time playing. I now know to never try to take over Asia first. Alrighty, so Florence is VERY different from Rome in many many ways. First of all it's very flat here. Which is nice. People ride bikes all overy the place and my companion and I keep saying thatwe need bikes, because it would just be so useful. We are slowly learning ourway around, and unfortunately my sense of direction (notthat it was great before) but it's completely gone now. Hopefully it will come back. Another way that Florence is different is that there is a funny accent. They don't pronounce thehard "K" sounds. So instead of saying "coca-cola"like we do in english, they would say "hoca-hola". It's a little bit different to hear people say that they are going to "hasa" and that we are "amerihans". It's kind of funny actually- but I'll get used to it pretty quick, I'm sure. Lets see... also it's been super niceand sunny and our appartment is on the fourth floor, sowe go outside and have lunch and language study. I'm getting a really good farmers tan and I'm excited about it :). The area is absoultely beautiful and it's so much smaller than Rome. Centro or downtown is so concentrated here and then the rest is not quite so obnoxiously full of people. It's nice, I like it. Lets see... oh yeah, there are TONS of americans around here. Aparently a lot of tourists come to florence, andthere are also several universities around here. It's good, but kind of weird for both me andmy companion to hear englishso much on the busses. As far as the church goes uphere. There are two branches and I think on Sunday there were at least 50 people in church. It'sa little tricky to come in and pick up what sisters left 6 weeks ago, butwe're trying to find some of the contacts and investigators that they had. Another BIG difference is that we live in 4. The Firenze1sisters live in the same appartment, which is nice becasue they can tell us how to get places, but it'skind of hard becasue we don't even livein our proselyting area. It's about a 30 minute bus ride to where our area starts so that's a little different. In Rome if we just had an hour or so we could just go do some housenearby, but here that's not so much of an option, soit requires some different planning. I'm excited though, the members are great and seem really excited to have sisters again. Mycompanion is great... she kind of reminds me of Emily in someways- which is good. She's from Ogden, and also the youngest. Her dadwas actually a mission president here about 20 years ago and served his mission here so there are people who recognize her name. It's fun. Okey dokey...I've gotta go now. I actually forgot my camera today becasue it's charging, butI'll be sureto send some pictures nextweek. Life is good, and I'm looking forward to learning and growing in new ways this transfer. Love you all!! Well the big news today is that I'm headed to Florence, or in Italian Firenze. I leave tomorrow afternoon and I was packing this morning and have no idea how I'm accumulated as much stuff as I have. It's a pretty big problem as I'm trying to pack, but it's going alright. I'll be serving with Sorella Favero from Utah. We are being blown in- which means that both of us will be new to the city, but it's good, it just means a litte bit more of an adventure. I'll actually be in an apartment with 4 sisters which will be fun, but at the same time I'm going in with all sorts flashbacks from college roommates, but hoping for the best. I am excited to serve in a new area. I knew it would be hard to leave the people here, but it's hitting a little harder than I expected. Plans to visit in the future and facebook make things easier. I'm gonna miss Sorella Bennion, too. We have a lot of fun together and she helps me want to be better. But I'm looking forward to serving with Sorella Favero. A little funny note... it wasn't all that funny at the time, but this past sunday as I'm sure you know was the time change. Well, we found out the hard way that the time doesn't change for a few more weeks here in Italy. We got to church an hour early and figured that EVERYONE was really late, or that it wasn't the same here. We're sad that we missed out on an hour of sleep, but we set up the chairs for church and got to read scriptures and talk with some members so it was a good mistake. Jackie set a date for Baptism! I'm pretty sad that I won't be here, but she's set April 29th. She's doing well and I want to thank all of you for your prayers on her behalf. I really have been able to tell that they were coming. And please keep them coming as the adversary works so hard to keep the work from progressing. On Sunday we were able to go to the Villa (Mission Home) and have a lunch. We had an appointment with Jackie for after church and she came with us and it was great. The elders have been working with a lot of refugees from Africa and they came to the dinner as well and one of the shared his story of how he got to Italy from Africa. I wish I had time to relay the whole story to you, but suffice it to say that I appreciate more than ever how very blessed I am to have been born in the United States and to have the priviledges and safety that I so much take for granted. He truly had faced some horrible things and we were all very humbled. We had a great DDM on Monday where we discussed why we are so blessed when others seem to live in such awful circumstances. One of the things that I hadnt' really thought much about was having a testimony that our Heavenly Father really does love them as much as he does me even when it seems like I am so much more blessed. Those men who came to church on Sunday were so humble and are prepared to accept the gospel becasue of their humility- and I truly know that our Heavenly Father loves them so much. Okey dokey... Time to head out. We have some people to see and places to go. Love you so much!! 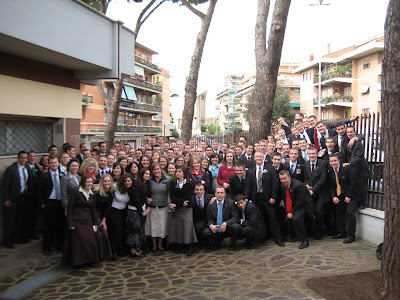 I have so many pictures that I've taken with members and contacts here in Rome, but I'm only going to send this one. This is Sorella Bennion, Jackie, and Me. This was my district for the past transfer. A great group, if I do say so myself. I'm pretty sure that we have the biggest district ever. There are 13 missionaries in my district. Some zones only have 12 and 14. This is behind the Mission home with a bunch of missionaries and the Refugees. Well, we had a few days where I thought it might be heading on towards spring. For almost a whole week it was sunny. There were a few days where it was still really chilly, but a few where I didn't even need a jacket, but alas, it is cold and rainy again :( But spring will come... I have no doubt. I have to admit I'm a bit jealous about the snow there. Snow at home is one of my favorite things. I'm excited to see lots of pictures. To answer your question, as far as I know there is Daylight savings time here. I have no reason to think that there isn't. We've mentioned it to a few people and they haven't acted confused or anything, so I do believe this sunday we will be springing forward. That does sound fun bowling in the Wii. The other day in church they announced a bowling activity for the young men and young women and that it would be at church. I was a little confused, but thought that maybe bowling was just a little different in Italy, but they actually played on a Wii. It was a fun activity for them and a very good idea. They had it set up on a projector and had a pretty good turnout. They actully had a primary activity at the same time and a ward activity afterwards. It's pretty far for most people to come to church so when there is an activty it is usually a bit more involved. The ward activity was actually a dance. My companion and I didn't stay, but were there early to help set up, we had an appointment that night, but it sure looked like it was going to be a fun night. Time is going super fast for me some days and then other days- not so much. But all in all it is crazy to me that I'll be close to coming home in a year. I still have SO much to learn I don't know if 4 more years would be long enough, but hopefully I can fit as much into this year as possible. This past week was a litle rough for me. I was just feeling a little discouraged. We had had a few experiences where I felt like we had just let people down, and that I was just not good enough. I was trying to help a few people with some things (organizing a move) and I just couldn't make everyone happy. It was just kind of stressful and overwhelming. I had a little bit of a breakdown. Not really a breakdown, but I cried my first real tears of the mission. I've had a silent tears in a spiritual setting, or from laughing too hard, but this was the first time I'd been so overwhelmed that there was nothing else to do but cry, I was laughing through the tears as I relayed my troubles to my wonderful companion, but I really hate crying in front of people. Anyhow, I thought I was alright and that most people would be gone from church so we could just slip out and go home for lunch and wouldn't see my red face, but as luck would not have it the Elders were still at the church and I can't handle any amount of sympathy, so as soon as it was detected the tears started again. I think the water level was just too high becuase I hadn't cried for a long time : ). The next day after DDM I asked for a blessing of comfort. And it is truly amazing to me how much my heavenly father loves me and is just waiting to pour out blessings. In the blessing I was promised that I just need to open my heart to feel the love the Lrod. I am sometimes so stubborn and try to do things on my own. Part of my prayer everyday is that I can become what the Lord wants me to become and as I was pondering that in my personal study I felt inspired to look at the For the Strength of Youth pamphlet. The first page I opened up to was actually the last section entitled "Go forth with faith" and it said exactly what I needed to hear. A small miracle just for me. I'm trying to have more faith and let the Lord help me, because as it says in the pamphlet "you need His help." It is so clear. Aside from that experience we have had some wonderful experiences this past week with investigators and potential investigators. We have Cornelio, whom we met on the bus and is truly prepared to recieve the gospel. He came to church this past week and is reading the book of mormon. He's from Romania and doesn't speak Italian very well, but can understand well enough. Then there's Simona who is also Romanian and actually lives across the street. The elders saw her at the bus stop and gave her a pass along card and she actually called them and asked for the "Finding Faith in Christ" video. So we took it by and gave it to her. We saw her at the bus stop a few days later and said that she's watched it 3-4 times and that she cries every time. I'd been carying around a Book of Mormon in Romanian just for her and we gave it to her. When we gave it to her and she realized it was in Romanian she started crying and gave us hugs and kisses as she thanked us. She's having a rough time now as she does not have work and thankfully is turning to the Lord. Jackie is doing well. She did talk with her boss, and he's told her that at the end of this month she won't have to work Sundays. He's said this before, but hopefully it will be true this time. She came to English class last night and we have an appointment with her again on Sunday. She told us about this week when she was taking a test and promised the Lord that if he would help her superare (to overcome) that exam that the first thing she would do when she got home would be to read the scriptures, so she went home and read the book of mormon. She is great. She seriously works so much and sometimes can only read a verse or so every night, but she does it and that is WONDERFUL!! Life is good. There is really no reason why I could complain. Transfers are this coming week and I have a suspicion that my days in Rome 2 are numbered. We will find out on monday and then actual transfers are on Thursday so I'll let ya know if I'm staying or going next week. I'd be sad to go just becuase there are so many wonderful people here, but at the same time I'm excited to see other areas. Okay, well I've got to go and give Anziano Pearson his comptuer back. But I love you all and want you to know that I am so thankful to be involved in the Lords work! I hope you have a great week! Sorry, only one picture today, but this is on one of the bridges near a bus stop. I'm not sure exactly what the significance is. I know that there is a really old statue of this wolf that I studied in my Humanities class, but I can't remember exactly what it means. Anyhow, it is kind of a symbol of rome as well as the letters SPQR, which are everywhere, and I'm slightyly embarassed to say that I don't know what they mean, but it is a very Roman thing. Enjoy!